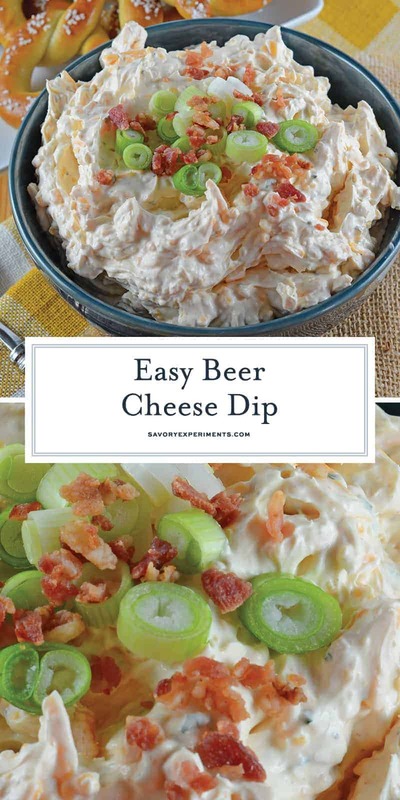 Beer Cheese Dip is a fun and flavorful dip to serve as an appetizer or starter at a party! Sharp cheddar cheese, cream cheese, some spices, horseradish, bacon, scallions, and or course beer make up this mouth watering pub cheese! Beer Cheese Dip is an easy, spreadable, zesty pub cheese great for serving with soft pretzels, crackers, carrots, celery sticks or chips! Beer Cheese Dip! One of my favorite things about going to a pub or brewery is the pub cheese. I like the Beer Cheese Dip, but I also LOVE the soft pretzels. Soft pretzels are my weakness. This recipe is a zesty, no cook recipe that is perfect for any party year round. If you’ve been to the gourmet cheese section at your grocery store, I’m sure you’ve seen tubs of overpriced pub cheese. Usually flavored with beer or wine, the whole concept of pub cheese was developed in England by pubs that didn’t serve whole meals, but wanted something extra with their pretzels and chips that was cheap and easy. The origins of pub cheese make it laughable that it is now considered gourmet and so darn expensive. Pub cheese gets most of its flavor from the alcohol and cheese selections, so choose wisely. Although I usually prefer to sip on a light beer, I use something with more body and flavor for cooking. If you are serving to children or pregnant woman, you can simmer the beer prior to adding to burn off alcohol or just substitute with water. Allow to cool before combining into mixture. If you prefer to not use alcohol at all, you can substitute water, but be mindful this will directly impact the flavor, so you may want to add more horseradish or other spices. Although cheddar is the standard, you can also change the flavor by using a different type of cheese, even flavored cheese like a horseradish cheddar or another artisan blend. 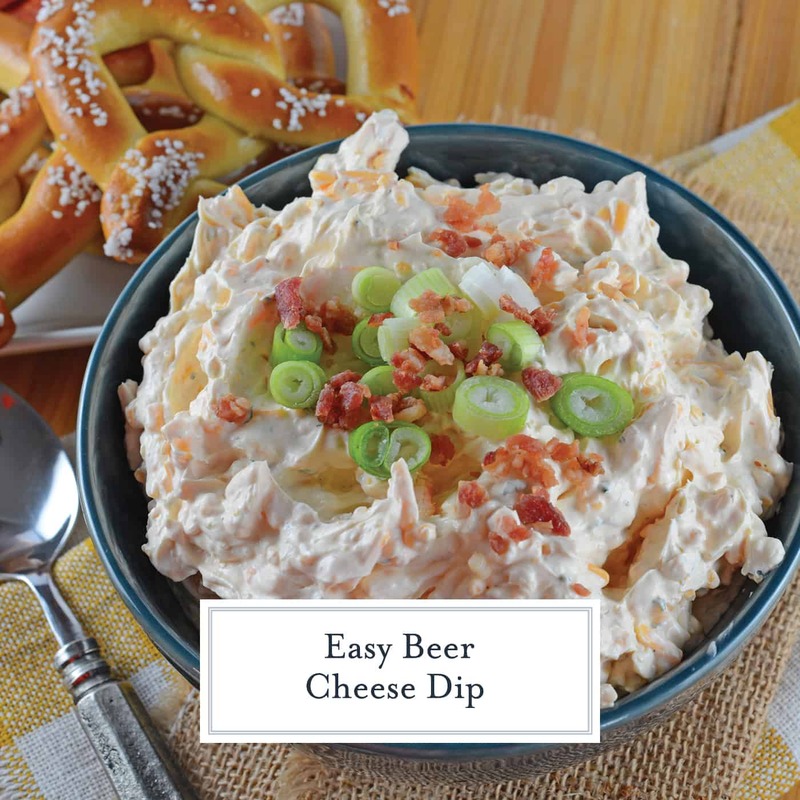 Serve your Beer Cheese Dip with hard pretzels, soft pretzel bites, chips, crackers, celery or carrot sticks or with a fresh baguette. You can even make things a little fancier by serving in ramekins for individual appetizers. 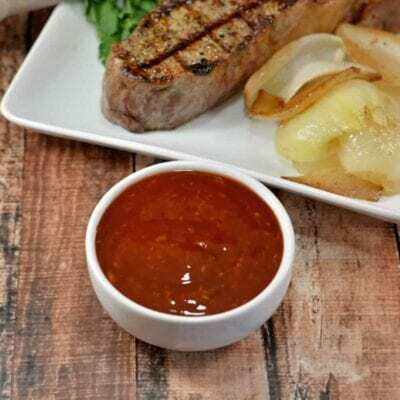 Ramekins– I like giving folks their own individual sauce cups. Then you don’t have to worry about double dipping! Ramekins are also great for ingredient preparation and baking mini soufflés. Place sharp cheddar, cream cheese, beer, dry mustard, cayenne, horseradish, parsley and sea salt into a food processor and pulse until blended. Mixture may have some small lumps. 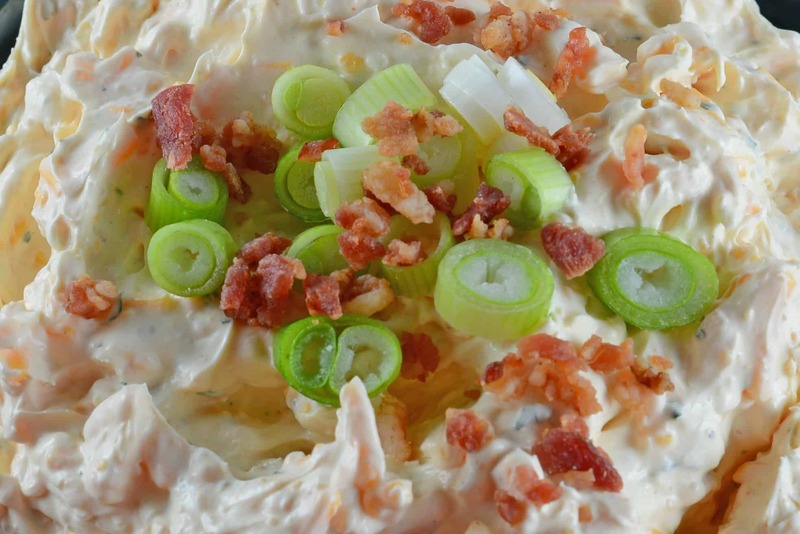 Garnish with crumbled bacon and scallions. If you've tried this recipe, come and let us know how it was! Use prepared horseradish or a horseradish sauce, it depends on the flavor you desire. I made my recipe with beer and no parsley as I didn’t have any parsley. The texture is runny and not firm and fluffy like the photo. Also, I only used 2T of horseradish and that is the most prominent flavor. I’m hoping it tastes better when I eat it with the pretzels. Don’t know if I will make it again. This came out perfect for me. I halved the recipe (regrettably after I tasted it). If anything it was a little thicker than I was hoping for as I was going to serve it with some fresh baked, soft bread. I thinned it with more beer (hooray beer!) until the consistency was what I was looking for. I love horseradish, so I used quite a bit and it’s got a delicious punch! Great recipe. Thanks for sharing! Hi Quincy! Thanks for stopping by to let us know and I am SO glad you loved it. I agree, HOORAY BEER! Good flavor, but ended up like cold soup! I followed the recipe correctly and was so dumbfounded as to why it didn’t turn out thick and creamy. Way less beer might have helped. Cooking it did seem to help thicken it and it was yummy warm. Never will use this recipe again though. I’m sorry to hear this recipe didn’t work out for you. I make it quite frequently and have never had any issues. Maybe the cheese you used with a high moisture? Can you forgo the beer altogether? What would be a substitute? Hi Mary! I’d just use water or even white wine, white cooking wine…. Followed this recipe to a T and it turned out incredible! I was skeptical about the amount of beer used as I didn’t want the dip to be runny, but it wasn’t a problem after all! Very creamy and flavorful on crackers. 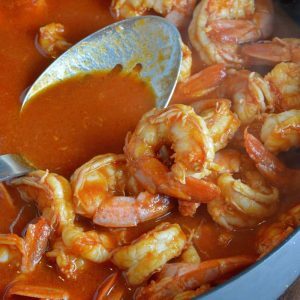 Definitely give this recipe a try if you own a food processer! Easy Pub Cheese sounds awesome and I love how simple and easy it looks to make! I love these spread cheeses we enjoy in pubs or as an appetizer in restaurants. I am bookmarking this easy pub cheese to make it for my friends! Oh wow!! This sounds so super delicious!! I have never heard of or tried anything like this. I think I have really been missing out! This sounds completely awesome! I can’t wait to make it this weekend for our football party! 🙂 Thanks for the recipe! That looks so yummy!! I am going to have to make it. 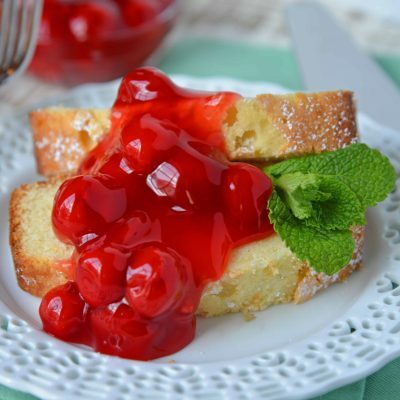 Yum, I am going to make this. Anything that goes with beer or made with a great beer is up my alley! This looks so yummy! I want to make this right now. I always love finding new recipes for delicious dips and spreads. This does sound delicious and I might try this at my holiday party. Thanks for the recipe. I’d make this for a holiday party or for Thanksgiving. Looks good. Thanks for sharing the recipe. That looks yummy!!! 🙂 I should make this for my husband. He would love it! I’ve never heard of pub cheese before but I like cheese and like beer so I’m sure I’d love this! 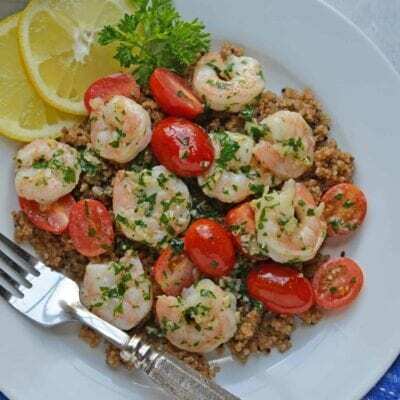 I’m going to make this later this week! 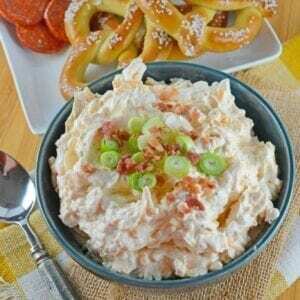 I make a cheese dip for pretzels similar to this and use Guinness. It’s always a party fave. I’ve never had this dip and it looks fantastic! I will have to mark it and make it.. looks really good. 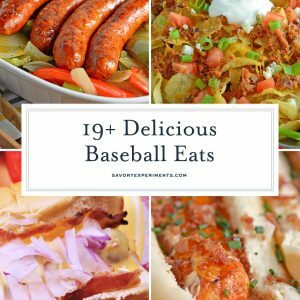 Sounds good I will have to try making this for the next game night viewing party! I’ve never had pub cheese before. I have to say though, this sounds like a simple recipe and actually pretty darn tasty. Oh yeah! I LOVE cheese spreads like this. You can’t beat cheddar and horseradish. This sounds delicious. I can see this with some pretzels and a great football game on the big screen.